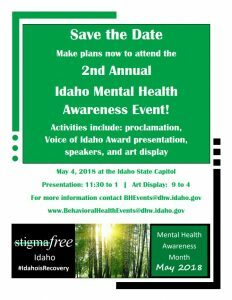 2nd Annual Mental Health Awareness Event! This should be a day full of empowerment and information. 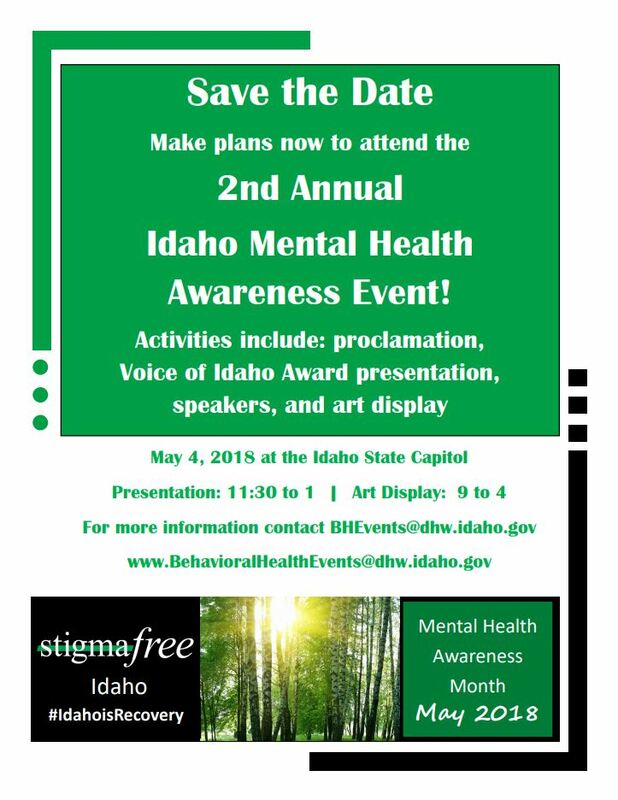 The Idaho Department of Health and Welfare and other state agencies are in the process of transforming the children’s mental health system. The implementation plan that will make changes to the system includes training parents and caregivers about the new system of care, services and how to access these services. The plan is also looking to engage families in outreach and in educating other stakeholders. ******Would you please take a few minutes to provide us with your thoughts and ideas regarding how you like to be trained, what types of training you prefer, and the approach we should take to engage, educate and involve parents/caregivers in the training process. Please complete this survey by April 30, 2018. It should take about 10 minutes of your time. Thank you! Maggie O’Mara, KTVB 10:27 p.m.
BOISE – Lullaby Waters is not your typical occupational therapy clinic. It focuses on the healing power of water, and children with special needs are seeing real results from this unique form of therapy. Nickell is passionate about helping children with special needs, but getting her idea off the ground was a big undertaking. The first challenge came in finding a landlord that would accept the installation of a pool. Nickell found a spot in a building on Broadway Avenue. Now six months after opening, the indoor aquatic therapy center is a dream come true for Nickell. Nickell says the serenity provided by aquatic therapy is second to none, especially for children with special needs. “Leona has cerebral palsy and she has very high muscle tone, so we’ve been working with Leona to try to help her relax and find that peace, that calm, decrease her pain,” said Nickell. BOISE – Brandi Hosman of Buhl has overcome so much in her young life. She has survived two horrific car accidents, two comas, and she had to relearn everything after a severe brain injury. This past spring, she was crowned 2015 Senior Miss at the Idaho Miss Amazing pageant. It’s a pageant that celebrates girls and women with disabilities. And last week, she competed in the national pageant in Los Angeles with the other title holders from Idaho. The path to Los Angeles has been a long one for the 29-year-old, who was severely injured in a crash back in June 2002. She was just 16 years old and was behind the wheel. Brandi was airlifted to a Boise hospital. With a lot of therapy and her family’s love, Brandi started coming back. BOISE — An exciting endeavor is happening at Boise State University. It is all about veterans and the university’s commitment to the men and women who serve our country. We all know that Boise State is known for its football program, but did you know that Boise State has been named a “Military Friendly School” by GI Jobs Magazine for six straight years. Now the university is increasing its commitment to veterans. With an official cut of the ribbon, Boise State University’s Veteran Services Center unveiled a new, on-campus Veterans Lounge — a special place for veterans and their families. The Veterans Services Center has already been assisting the university’s veterans with various programs like benefit claims and opportunities in the community. Now the new veterans lounge will be a place for veterans on campus to simply hang out — with game tables, TV and a kitchen area. Boise State leaders say the new space represents the university’s dedication to growing and supporting the educational endeavors of veterans. “We’re very happy for this moment because it means that it’s a space for our veterans to socialize, but more importantly it’s a space for our veterans to form a greater community here at Boise State,” said Dr. Christian Wuthrich, Dean of Students. “Our goal is to make sure that you find the success you need in that next stage of life and that you share with us all your experiences all the richness that you can bring to us because you make us better by your presence,” said Dr. Lisa Harris, Vice President of Student Affairs. R.K. Williams, Coordinator of Veteran Services, and Dr. Harris had a little fun with today’s opening by playing the first game of pool on the new pool table. NAMPA — A 7-year-old Nampa boy is overcoming a debilitating disease to take on an inspiring journey as the new MDA State Ambassador. He has some big plans to make a difference in our state. Jayden Long was diagnosed with mitochondrial myopathy – a form of muscular dystrophy – when he was just three. It causes him to become easily fatigued, his lungs are weak, and he’s losing some muscle function. But that’s not holding him back. The second-grader at Centennial Elementary School has been tapped to the be the 2015 state ambassador for the Muscular Dystrophy Association in Idaho. The night he was formally announced as ambassador was a special and emotional night for his family, especially his mom. The MDA means a lot to them. “When my son was first diagnosed, which is a very hard thing to deal with, they were there for the support, they were there for the education,” said Shellie. Jayden has an incredible, but busy, year ahead of him. “His biggest honor is he gets to speak at the state firefighters convention,” said Shellie. Our firefighters collect donations every year for the MDA by filling the boot, and that helps pay for research and programs like the MDA summer camp for kids. Jayden wanted to give back to those firefighters. “On Christmas Eve I got the idea of bringing little fruit trays and treats to the firefighters to say thanks,” he said. Jayden’s mom knows her son’s struggle well. She was also diagnosed with the same form of muscular dystrophy. Tragically, her other son died at just 77 days old from pneumonia, a likely complication of mitochondrial myopathy. “Jaxon had passed away in his sleep … to say the least it’s the hardest thing you ever go through ever,” said Shellie. You can see why this honor is so important to Jayden and his family. He plans to work hard to spread awareness and raise money for the MDA. Carey Crill is currently accepting patients in our Boise location. If you were formally a patient of Carey’s or would like to establish care with Carey please call us today at (208) 338-4699. The state’s effort to rein in Medicaid costs has created deep friction between small businesses that deliver behavioral-health services to Medicaid patients and a new contractor hired to manage them. Service providers across Idaho have raised complaints over the last 11 months that the contractor, Optum Idaho, a unit of United Behavioral Health, has created red tape and cut services needed by at-risk patients. Now providers in the Treasure Valley have raised another complaint: Optum isn’t paying them promptly, putting their businesses’ survival and employees’ jobs at risk. Optum says it has fixed a glitch that resulted in tiny claims payments to the companies, which provide counseling and other behavioral health services to low-income and disabled adults and children on Medicaid. Optum says it erroneously sent small checks totaling amounts like $.05, $.07, or $.11 starting Aug. 1 to providers who care for Medicaid patients who need behavioral-health treatment. “(We) apologize for any inconvenience caused by this temporary error, and we invite any provider with concerns or questions to call Optum Idaho,” Optum said in a statement. But some providers say the problem actually began last September, when Optum took over management of Idaho’s Medicaid behavioral health system. Two of the Treasure Valley’s largest mental health care providers for Medicaid patients say these tiny payments have recurred throughout Optum’s first 11 months in Idaho. A new report says Idaho will lose $3.3 billion in federal Medicaid funds, and $1.5 billion for hospital reimbursement, over roughly the next decade by not expanding its Medicaid program to all poor adults. The report from the Urban Institute and the Robert Wood Johnson Foundation, released Thursday, says Idaho’s savings and new state revenues from a Medicaid expansion would the cost of implementing an expansion. Hospitals also would get reimbursed for newly eligible Medicaid patients who now lack insurance. States were required under the 2010 Affordable Care Act to expand their Medicaid programs to include anyone living in poverty — not just poor children, poor pregnant and new mothers and adults with disabilities, as is the case in Idaho. However, the U.S. Supreme Court ruled that states don’t have to comply with that part of the law. The Idaho Legislature and Gov. Butch Otter have opted not to expand Idaho’s Medicaid program. States that expand Medicaid will have at least 90 percent of their new Medicaid costs covered by the federal government, under the law. Idaho lawmakers have voiced concerns about that federal-match rate being cut, leaving Idaho responsible for medical costs of significantly more people — a concern the new report addresses. EAGLE — Students at Eagle Middle School are going the extra mile to help out one of their classmates — they’ve raised more than $3,300 to help buy a special bicycle for her. We first brought you Meghan Wildman’s inspirational story last June. The 13-year-old was paralyzed in a car accident last year. At the time, Meghan’s dance teacher made her dream to dance again possible, helping her to learn to dance in a wheelchair. In addition to dancing, Meghan also loved bike riding, but hasn’t been able to since her accident. Her friends at school decided to change that. Seventy-eight National Honors Society students organized Miles for Meghan – a rally to raise the money to buy her an adaptive hand cycle. In the last year, Meghan has been doing a lot of physical therapy to get stronger. Hope that Meghan will walk again with the help of braces. Her family is overwhelmed by the show of support from Eagle Middle School.